The PAV ontology specializes the W3C PROV-O standard to give a lightweight approach to recording details about a resource, giving its Provenance, Authorship and Versioning. Our paper on PAV explores all of these aspects in details. In this blog post we would like to discuss Versioning as modelled by PAV. Versioning is commonly used for software releases (e.g. Windows 8.1, Firefox 26, Python 3.3.2), but increasingly also for datasets and documents. For the purpose of provenance, a version number allows the declaration of the current state of a resource, which can be cross-checked against release notes and used for references, for instance to indicate which particular version of a dataset was used in producing an analysis report. Versions in PAV are quite straight forward. For our working example, let’s look at the official releases of the PAV ontology itself. Note that PAV is intended for describing any kind of web resource (e.g. documents, datasets, diagrams), not just ontologies, but we’ll use this example as it allows us to explore versioning both from a document and a technical perspective. The property pav:version gives a human-readable version string. Note that there is no particular requirements on this string, we could just as well have labelled the versions “red”, “blue” and “green”. Many resources such as a regular home page or an Excel spreadsheet of expenses does not have any formal versioning process, and probably won’t really benefit much from semantic versioning, in which case the best options would often be increasing numbers (“19”, “20”, “21”) or ISO-8601 date/time stamps (“2013-12-24”, “2013-12-28”, “2014-01-02 15:04:01Z”) – both which can easily be generated by software without needing any understanding of the nature of the change. In the figure above, each versioned resource have their own URI to allow you to retrieve that particular version. Although there is no requirement for such availability, it can be quite beneficial for several reasons, particularly combined with semantic versioning. For instance, the way we have deployed our ontology means that if you wanted to use PAV version 2.1 without any terms introduced in 2.2 or later, then you can use http://purl.org/pav/2.1 to consistently download (or programmatically import) the ontology as it was in version 2.1. (Side note: We deliberately have not versioned the PAV namespace, so pav:version expands to http://purl.org/pav/version no matter which ontology version was loaded. To avoid misunderstandings such as http://purl.org/pav/2.0/version we removed the trailing / in the version URI from 2.1 onwards). Note how pav:previousVersion goes directly between the resources, in PAV the ‘previous version’ is not a free standing tag separate from the resource, but an actual copy or snapshot of the versioned resource as it was in that state. This eventually forms a chain of versioned resources, here providing the lineage of version 2.3 through 2.2 and 2.1 to 2.0. In PAV, pav:previousVersion is meant to be used as a functional property (pointing at a single resource); this means that for any given resource, only the exactly previous version is stated directly, to find any earlier versions you can follow the chain. In this example, dataset-1.0.0.csv has been pav:importedFrom survey.xls, i.e. probably saved from Excel (the software can be specified using pav:createdWith). The Excel file was imported from an SPSS survey data file, but in addition had a pav:sourceAccessedAt the survey form (e.g. the creator looked up more descriptive column headers). For dataset-1.1.0.csv we (as humans) can see the minor version has been incremented, and that it has a different provenance, this version was imported from dataset.xlsx, which has been pav:derivedFrom the earlier survey.xls (indicating that the spreadsheet have evolved significantly). The data was imported from a different survey2.spv (which might or might not be related to survey.spv), but still accessed the same surveyform.docx. For dataset-2.0.0.csv the provenance is quite different, this time the scientist has simply used Survey Monkey rather than SPSS to manage their survey, and have simply published its exported CSV. Presumably this dataset is quite different in its structure, as it has gained a new major version to become 2.0.0. Note that if the content of the dataset (its knowledge) had significantly changed, e.g the old dataset showed baby birth weights while the next dataset was a survey of pregnant mothers, their education levels and their baby’s birth weight, then the new dataset should rather be related with pav:derivedFrom. Adding other PAV properties to relate agents to versions, such as pav:createdBy, pav:importedBy and pav:authoredBy, can be useful particularly to attribute different people involved with each release. While we have presented versioning with PAV, other vocabularies exists with alternative ways to model versions. While at first prov:wasRevisionOf seem to achieve the same as pav:previousVersion, the PROV definition is focusing on revision as a form of derivation. As the dataset example above showed, versions are not necessarily related through simple derivations, but can have their own provenance. It is unclear if prov:wasRevisionOf also might be used to give shortcuts to older versions, while pav:previousVersion only should be used towards the directly previous version. The PAV property also recommends giving the human-readable pav:version. Our derivation subproperty pav:derivedFrom is again intentionally more specific, requiring a significant change in content, and thus can be used to clarify the level of change. We made a mapping to PROV-O which explains the rationale for each PAV subproperty. prov:qualifiedRevision can be used to detail pav:previousVersion, here explaining the changes of the the dataset using rdfs:comment. Note that this figure does not show the qualified link prov:entity from the revision to dataset-1.1.0.csv. Note that it will often be difficult to assign a retrievable URI for the revision itself, unless some kind of versioning system (like Github or Google Code) provides a way to link to the change or revision itself. This kind of qualification pattern can be also be used for other PAV properties that have PROV superproperties, such as prov:qualifiedDerivation on pav:importedFrom, or prov:qualifiedAttribution on pav:authoredBy, however in many cases it might be better to expand the change by relating entities to PROV activities. dcterms:replaces – A related resource that is supplanted, displaced, or superseded by the described resource. As mentioned before, this is similar to pav:previousVersion, but adds a stamp of authority as the older version is superseded or displaced. So for instance if our dataset-2.0.0.csv was experimental and not really a good replacement for 1.1.0 (say we really wanted to include eye colour), then dcterms:replaces would not be appropriate until there was a new “official version” – which might not be until 2.1.3. The inverse, dcterms:isReplacedBy, can be used as a forward pointing property to indicate that a resource is no longer current. dcterms:isVersionOf – A related resource of which the described resource is a version, edition, or adaptation. Changes in version imply substantive changes in content rather than differences in format. This property is quite wide, in that it could cover any kind of adaptation, like the Romeo+Juliet movie being a version of the Shakespeare theatre play Romeo and Juliet. In provenance term, such adaptions are normally covered by prov:wasDerivedFrom (the movie was based on the theatre play) or prov:alternateOf (the movie as an alternate of a theatre performance), while differences in abstraction levels (e.g. the DVD vs. the movie in general) are covered with prov:specializationOf and FRBR-like abstraction models. Additionally, pav:previousVersion does not normally cover substantive changes in content, that should be described using pav:derivedFrom. dcterms:hasVersion – A related resource that is a version, edition, or adaptation of the described resource. This is the inverse of dcterms:isVersionOf, but also suffers from sometimes being used as a kind of prov:qualifiedRevision pointing at a free-standing revision resource (as in our dataset example above), or as a more hierarchical unversioned-to-versioned relationship (prov:generatizationOf). Even within the DC Terms history there seems to be a confusing mix of dcterms:hasVersion and dcterms:replaces that hints of hierarchical use, but also makes a resources have themselves as versions. PAV has a mapping to DC Terms (available as SKOS) which explains how the two vocabularies could be aligned, however we have not included the versioning part of this mapping in the formal OWL ontology due to the above reasons. schema:version – The version of the CreativeWork embodied by a specified resource. This can be seen as a more specific version of pav:version, the biggest difference is that schema:version is typed to be a schema:Number, and so might not cover versions like “1.5.2” or “2014-01-05”. schema:isBasedOnUrl – A resource that was used in the creation of this resource. This term can be repeated for multiple sources. This is more of a loose provenance term which could be seen to cover all of pav:sourceAccessedAt, pav:importedFrom, pav:retrievedFrom, prov:wasDerivedFrom and prov:wasInfluencedBy. schema:successorOf – A pointer from a newer variant of a product to its previous, often discontinued predecessor. While this description is similar to pav:previousVersion and dcterms:replaces, the term seem to only be used from/to schema:ProductModels which would not cover web resources that are not product sheets. The same applies to its inverse schema:predecessorOf. schema:isVariantOf – A pointer to a base product from which this product is a variant. It is safe to infer that the variant inherits all product features from the base model, unless defined locally. This property, also only used from/to schema:ProductModel, is a specialization of dcterms:isVersionOf and prov:specializationOf. pav:hasEarlierVersion point to any earlier version, not just the directly previous version. This is a transitive super-property of pav:previousVersion, which means you can build a linear chain of previous versions, and imply all the earlier versions. (Importantly pav:previousVersion is NOT transitive). For simplicity there is no inverse property for the later version – as we think an earlier version shouldn’t make “future” declarations, rather the newer version should indicate its earlier version (following the direction of provenance). This shows how http://purl.org/pav/ is a more general entity that spans across the multiple snapshots, therefore pav:hasVersion is also a subproperty of prov:generalizationOf – indicating the hierarchical nature of the entities describing the same thing with different (time) characteristics. Note that unlike dcterms:hasVersion, pav:hasVersion goes to a snapshot – the version should be retrievable at its URI, so it would usually not be good taste to use pav:hasVersion to a revision info page that does not include the page as it was in that version. However for Software Releases, using GitHub release pages as versions is probably a good idea. Thus pav:hasCurrentVersion is useful to provide a permalink for a dynamic page. Often this is what people have meant with a more functional use dcterms:hasVersion – pointing to a single current snapshot – where older snapshots would have dcterms:isVersionOf backlinks. While that pattern might have been used, it is not formally defined as such by DC Terms. Here we can see that there’s a “future” PAV version that may or may not later become the pav:hasCurrentVersion (it is infact now the current version).This is typical of software development, where you often have alpha versions and release candidates. It can be useful to have third-party “versions” (e.g. forks in software development) – where you would not find the official pav:hasVersion statement from the . In this case you should add a prov:specializationOf backlink and pav:derivedFrom statement to which version you forked. But this raises some challenges with pav:previousVersion, pav:hasCurrentVersion and pav:version. .. as pav:hasCurrentVersion should point to the permalink snapshot in a functional way, it would be confusing to also include its “current version” as “2” and “2.1”. So I suggest to let it always point to the “deepest” version. pav:version of the intermediaries should show the latest version of their pav:hasCurrentVersion – not a generic “2” or “2.1”. (You can use rdfs:label to say “2.1”). Note that software often have patch updates at “older” maintenance branches – e.g. it could be that the current 1.2 version is 1.2.9 even though v2.0.0 was derived from 1.2.3. If you want to describe merges across these branches, then you would probably need to add additional pav:derivedFrom statements. PAV is a lightweight ontology for tracking Provenance, Authoring and Versioning. 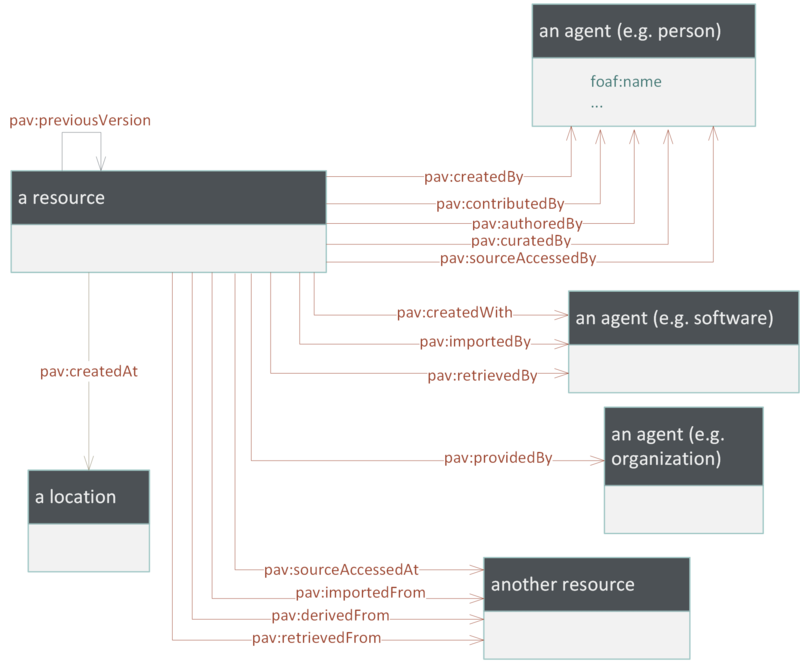 PAV supplies terms for distinguishing between the different roles of the agents contributing content in current web based systems: contributors, authors, curators and digital artifact creators. The ontology also provides terms for tracking provenance of digital entities that are published on the web and then accessed, transformed and consumed. PAV version 2.1.1 was released on 2013-03-27, making PAV an extension of the W3C provenance ontology PROV-O, thus enabling interoperability between PAV and PROV-compliant tools such as ProvToolbox. Note: PAV does not define any classes, and the PAV properties do not put any explicit restrictions on their domain/ranges. Therefore the classes above, like “another resource”, are only for illustration of typical use. The diagram above does not show data properties attached to resources, like pav:createdOn.